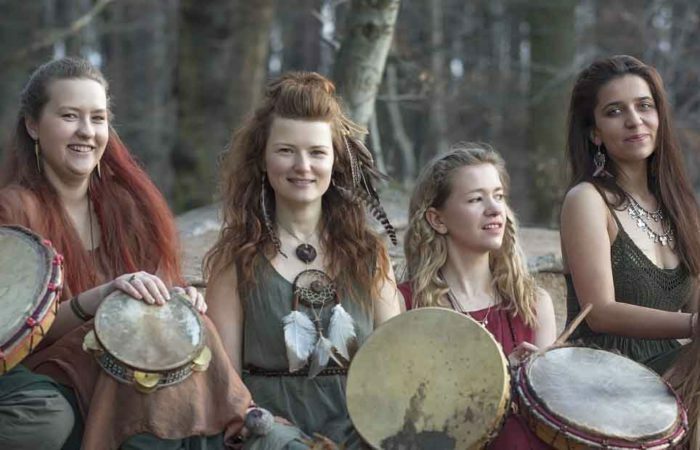 We feel grateful to welcome back in Amsterdam, the amazing sacred chant artist Ajeet Kaur for the workshop Rhythm of the Ancients and a magical Sacred Chant Concert. Both events are take place on March 29th (late afternoon and evening). There are single and combi tickets available (tickets are now Sold Out). UPDATE: tickets for the March 29 concert are SOLD OUT. There is an extra concert on March 28. Tickets for that concert are now SOLD OUT too. We’re very grateful for your interest! Ajeet Kaur is joined by Raffa Martinez on percussion, Aisling Urwin on harp and Ezra Landis on guitar. 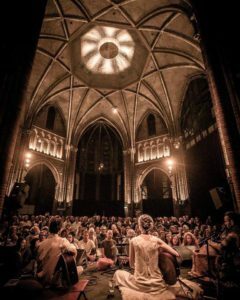 After last years sold-out concert and workshop we moved to a bigger venue this year, De Duif. A beautiful church in the center of Amsterdam! Join Ajeet and her band as they weave together ancient rhythms and melodies, deep meditative spaces and heart-opening songs to bring you on a journey through music. Let your voice join with many in a call for healing, a return to the ancient ritual of prayer through song. With her beautiful voice & her radiant presence she will touch your soul deeply and set your heart on fire. More info on Facebook here. The video clip below was shot during her concert we organized in 2017. In Ajeet’s Rhythm of The Ancients workshop you will connect with your voice in connection to the sounds and healing methods of our ancestors. Since ancient times people have used music, movement and the human voice as instruments for healing. 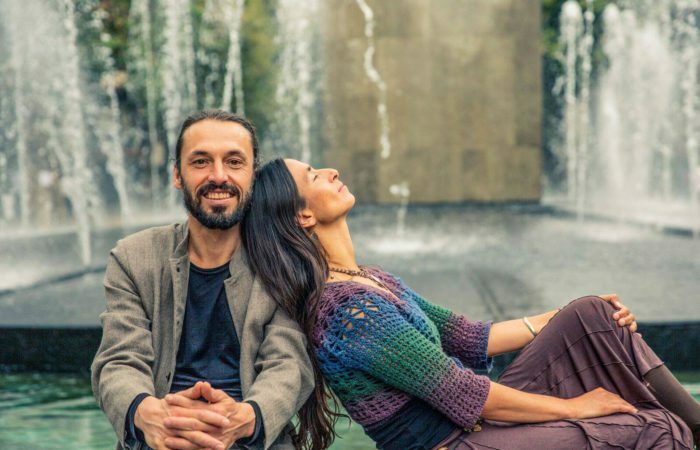 In this workshop Ajeet will share ancient practices, yoga, meditation and music to experience the stillness, peace and freedom that is our most natural state. These ancient practices have an incredible capacity to open us in profound ways, to peel away the layers of fear and hesitation, opening us to an experience of deep connection. Part of dwelling in that essence is finding our own unique ways of living in service, of carrying the healing we receive from our practice out into the world. 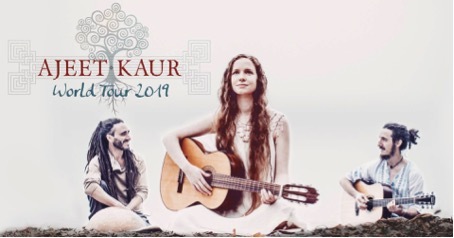 Join Ajeet Kaur and her band for an experience of practice and reflection to tap into the most genuine way for your soul to live as a healing presence. Don’t forget to bring your yogamat, blanket and waterbottle to the workshop. An afternoon full of voice opening, prayer and sacred chanting. Buy your tickets, here (combi tickets with the concert are also available). With her beautiful voice & her radiant presence she will touch your soul deeply and set your heart on fire. It is their third European Tour and they are just as excited as we are! An evening full sacred chanting. Buy your tickets, here (combi tickets with the workshop are also available). Ajeet Kaur will be joined by Raffa Martinez (percussion) and Ezra Landis (guitar) and Aisling Urwin on harp. The music of Ajeet Kaur is a meeting of rivers. 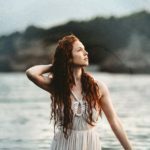 Her love of yoga, meditation and sacred music meets her upbringing with traditional Irish music and her unwavering love of poetry through song. Growing up in a musical and eclectically spiritual home in both New Hampshire and Dublin, Ireland, music has always been present. Ajeet found her way to the magic of sacred music at a young age, leading her to fall in love with the songs, stories and sense of mystery in the sacred traditions. 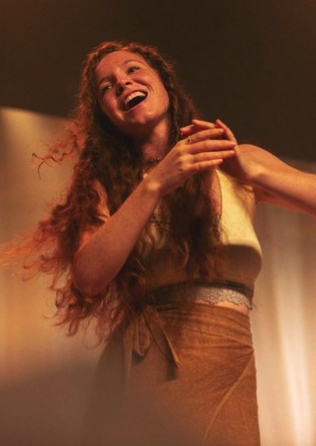 Her music has taken her all over the world, sharing song and healing in communities across the globe. Collaboration is central in her work, and some of her collaborators include Snatam Kaur, Trevor Hall, and Peia. Ajeet Kaur will be joined live by Raffa Martinez (percussion), Ezra Landis (guitar) and Aisling Urwin on harp. 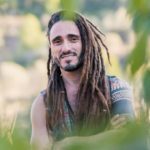 Raffa is a percussionist, songwriter, and ceremony holder from Barcelona, Spain. He has traveled learning both the rhythms and instruments of communities around the world, and the ceremonies that keep them connected. 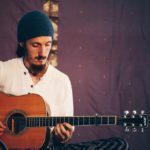 He now shares his music and his practice as one, holding retreats, touring and sharing what he has gathered. Knowing Raffa has been a huge blessing for me both musically, and in the space he carries with him. His presence always lets me relax into our concerts as if they were no different than a ceremony. Touring with him and having him on the new album Indigo Sea are an incredible gift. Ezra grew up in a home full of music in the mountains and forests of New Hampshire. A self-taught guitarist, Ezra has become a much loved instrumentalist for many touring artists, and has been featured on countless albums. I met Ezra when we were teenagers, and somehow we just kept playing together until it became our work, our life. Ezra has been an incredible musical support in my career, and on my albums. His friendship and our musical bond is a profound gift to my life and to the new album Indigo Sea. Aisling Urwin is a harpist and songwriter from the seaside town of Kenmare in the South West of Ireland. Her broad range of musical influences range from Kate Bush to Bon Iver to Jeff Buckley. 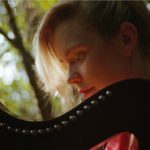 Aisling aspires to use the harp in a contemporary context, challenging traditional views in an effort to stretch people’s preconceptions about what the harp should sound like. Ajeet Kaur has released five albums, which have been celebrated as #1 on the iTunes world chart, and Billboard Top 10 new age chart. Her band members and collaborators help to weave the web of her songs both live in concert and in her released music. 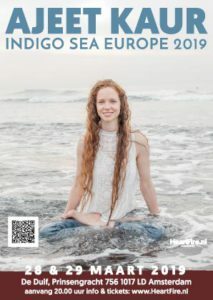 Her newest album Indigo Sea is a love-labor which was self-recorded and crowd- funded by her fans and supporters. Well, just you’re good self really. If you want to sit in front of the stage, then bring a cushion (if you don’t want to sit on the floor). Of course we have chairs too! A yogamat is not very practical during the concert, so everybody has chance to sit. More info on what to bring to the workshop, will follow. Tickets for the concert on March 29 are SOLD OUT. There is an extra concert on March 28, 2019 (update: tickets for that concert are now Sold Out too). Thank you very much for your interest! There are single tickets available for the concert or the workshop (both events are on March 29th). There are also combi-tickets for both the concert & workshop available. Update: Tickets are now Sold Out.